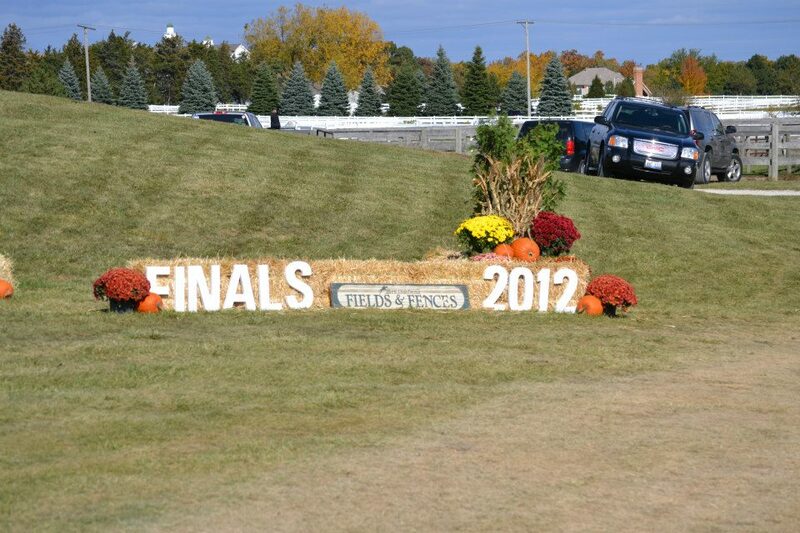 After attending several shows at the beautiful Sunflower Farms in Bristol, WI as a spectator, I was really excited about showing there last weekend. We were fortunate to have a gorgeous day, and there were some bright spots for Derbs and me. However, there were a bunch of challenges too, which started right off the bat when my sloppy horsemanship resulted in Derby taking a high-speed, unaccompanied tour of Silver Fern before I could even get his braids in. I had left his door ajar when I went in to curry him as he ate his hay. The other horses were being turned out, and Derby decided that he’d rather be outside with his pals thaninside eating hay. He was all wound up, and proved to be the very devil to catch. I finally got him back inside, and braided, but he was still fizzing with energy, so I put him on the longe before loading up. I was so unhappy. This was not our routine! Thankfully, Derby loaded easily, and the trip to Sunflower was uneventful. He settled right in and resumed his breakfast, and was as cool as a cucumber. Things were looking up. Cool in front of the judge …for the moment. Because I had the first ride of the day for our team, I didn’t have time to linger. I tacked Derbs up, and we went for a walk around the grounds, giving him a look at the rings and in gate before strolling over to the warm up. Derby was extremely composed and was being a very good boy. The warm up went pretty well, but we kept it short, because our second test was soon after the first. Fairly satisfied, we walked over to the in gate for our first test, Intro A.
Derbs went straight in and went around the outside of the ring, greeting the judge with no problem. Entering the ring, I could feel a little tension but he wasn’t bad at all. In fact, I had to give him a bit of a crack with the whip as we started the first circle because he was a bit behind my leg. However, he was leaning on my inside leg a lot, and I struggled to get him to move out throughout the test. All in all, I wasn’t terribly happy with my ride, because (as is so often the case) we’re doing much better work at home. But there were a couple bright spots. 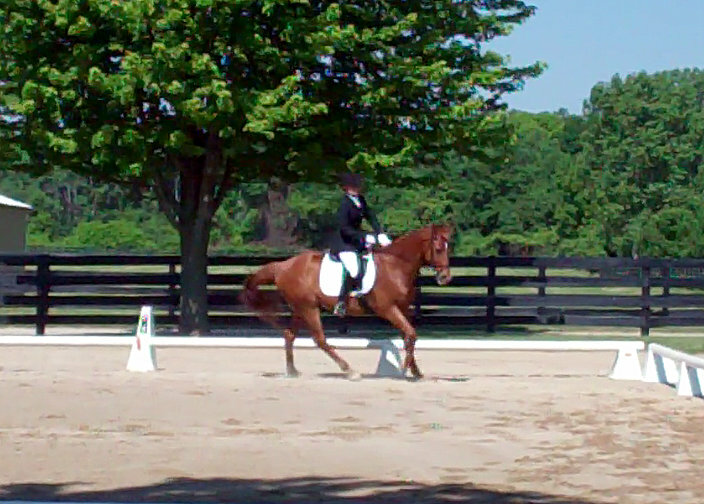 We got a 7 on one sticky transition from trot to medium walk that has been a problem for us all season. That 7 represents a huge improvement. 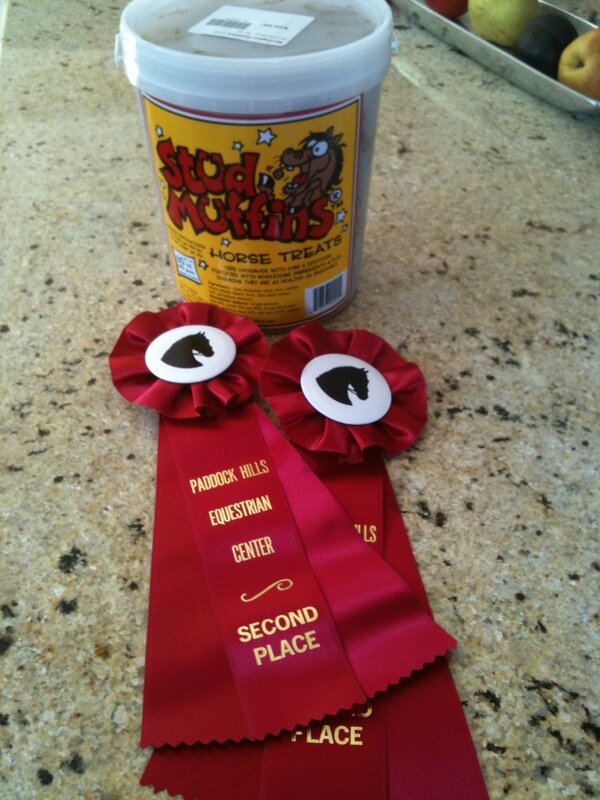 I also got my highest rider score, with a 6.5, up from the 6’s I’ve been getting this year. 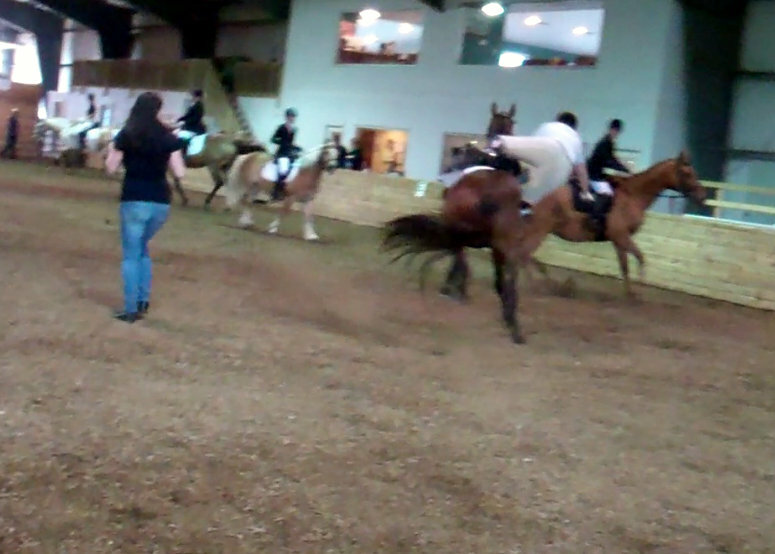 But the real surprise was the score for our last centerline and halt. We got an 8! My first 8! Yes, I was pretty thrilled by that. We wound up with a 64.5%, which is our best score of the year. We went back to the barn to chill for about 30 minutes, before heading back to the warm up. This time, Derbs felt awesome. We had some very nice work, and between that fact and his steady performance in the first test, I was feeling really confident about the second test. I was looking forward to getting into the ring and really riding for a score. Derbs, it turns out, had other plans. He melted down on me, spooking at everything he saw, whirling and scampering around willy-nilly. 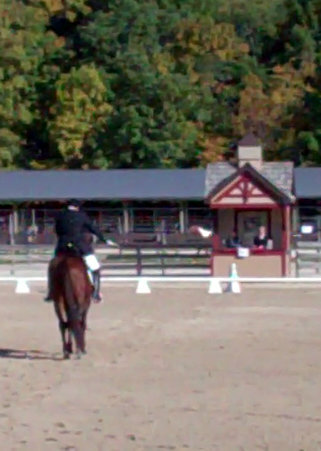 I got him past the judge’s stand, with the help of some enthusiastic coaching from judge Caryn Vesperman. We went back and forth in front of the stand, and I thought things were under control as we headed for A. He started the shenanigans again, and after hemming and hawing for a second I withdrew. There were a lot of people and some other horses in close proximity, and I elected to stay safe rather than upset and possibly injure others. Back in the warm up, after the melt down. 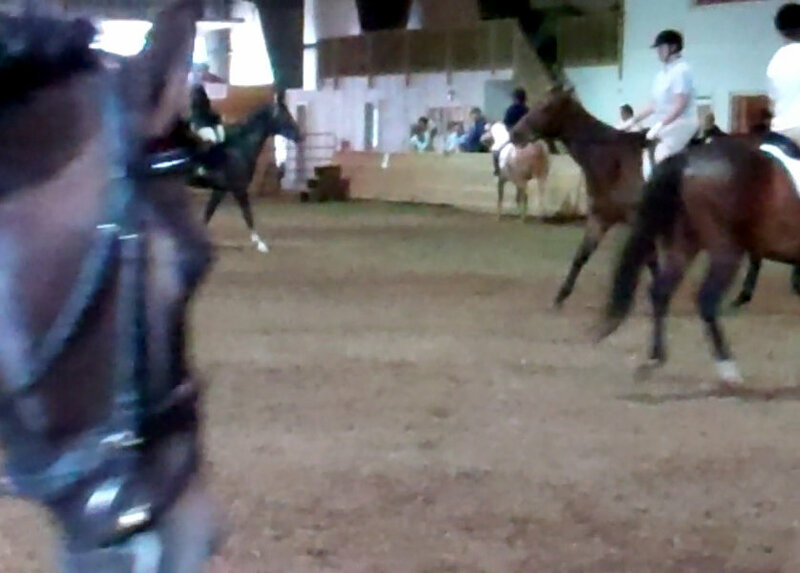 I dismounted, and stomped off to the warm up ring like a petulant 8 year old to go back to work. I mounted up, and put him to work. And once again, he was great. I won’t kind you, I was (and frankly remain) very annoyed with Derby and disappointed with myself. 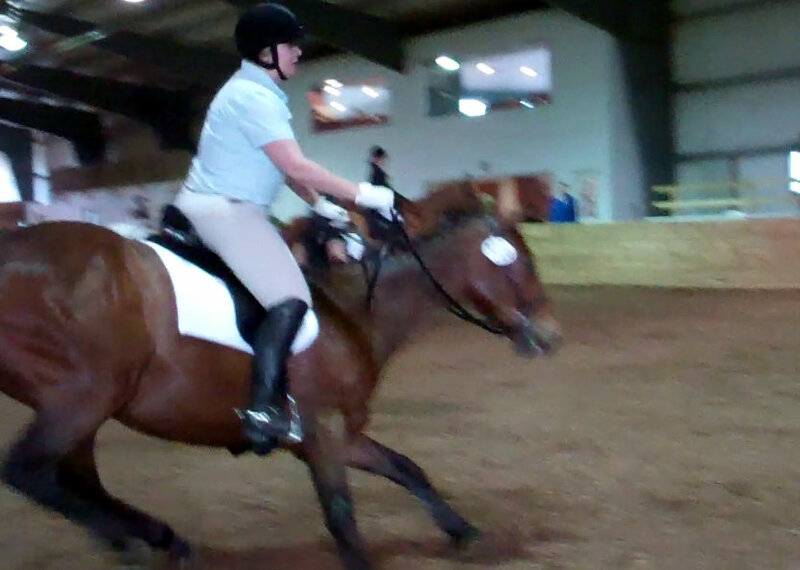 I wish I could have ridden him through that naughtiness, because he wasn’t legitimately scared. He was evading. Back in the barn, Derbs was pooped. I untacked groomed him, and left him in peace with a pile of hay. But no cookies. He didn’t earn extra cookies this time around. The extra cookie bag remains in my tack trunk. I’m saving them for the show when Derby is a good boy from start to finish. And then, there will be cookies. An obscene amount of cookies! We had some great energy, coupled with some tension that I didn’t manage well. Well, the first show for the year is in the books, and it was a great learning experience. My rides were scheduled for early afternoon, but were pushed back when a huge thunderstorm rolled in, dumping a ton of water on us and delaying the show for a couple hours. After that, the schedule went to hell, as a lot of people scratched. Instead of simply rescheduling the rides, we had to listen to for our names over the PA system – they were calling 4 riders at a time. When you first heard your name, that meant you had about 30 minutes before your ride. Energy was not a problem. 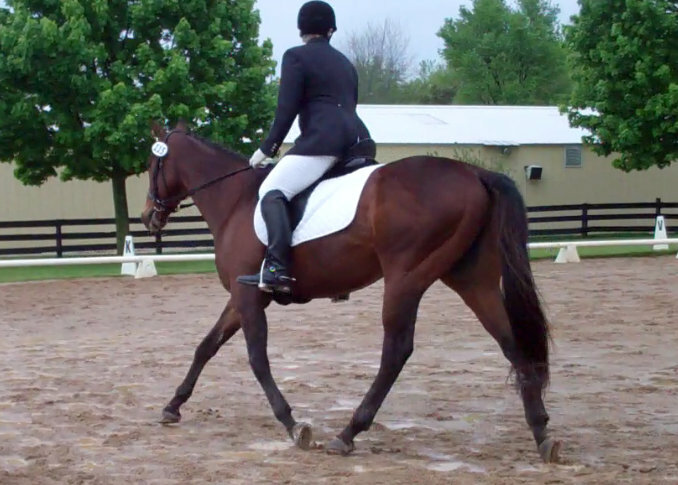 It started raining again as I mounted up for my first ride, and despite the fact that I had walked Derby around the show grounds twice in the morning, before the storm, I had a very tense, jiggy-horse walking over to the ring and going into the warm up. Energy was not a problem – Derby was really forward but not scarily so. However, he was not at all tuned into me, and I really struggled with his tension – and inattention. Derby’s neck was like a board and my half-halts were not going through at all. I worked some transitions, trying to get him dialed in, and really could have used more time because the warm up was 50 kinds of ugly. Thinking “It is what it is,” to myself, we headed for the ring. 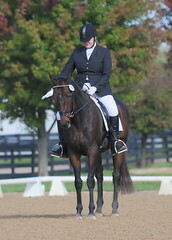 The first test was Intro A, which doesn’t require a halt at X upon entering the ring. That was a good thing for us yesterday, because I’m not sure it would have happened. Right bend? Nah, I prefer mugging for the camera. I really tried to allow him to stride out and go forward, which I did achieve at points, but I was not able to ride precisely or emphatically (?) enough to deal effectively with the tension. 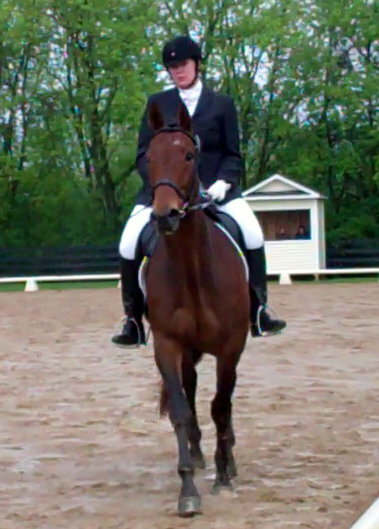 For most of the ride, Derby’s ears were pitched straight ahead. His attention was riveted elsewhere and my aids were not effective enough to soften him. 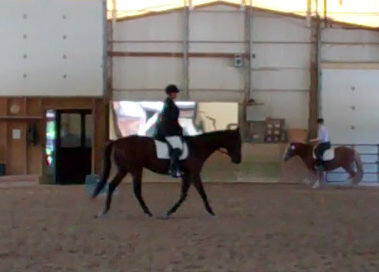 We got though the test and headed straight back to the schooling ring. I redoubled the emphasis of my aids, sticking the spur into his side with some real – shall we say – vigor. At that point the message did get through and he started to soften and respond to my aids. We got some better work and spent about 10 minutes working on relaxing and transitions. Since my next test was originally scheduled an hour and 10 minutes after my first, I took Derby back to his stall to chill for a few minutes. 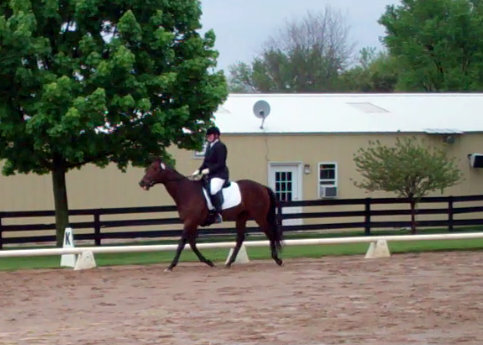 The horse I had when I pulled him out and mounted up for our second walk to the ring was entirely different. 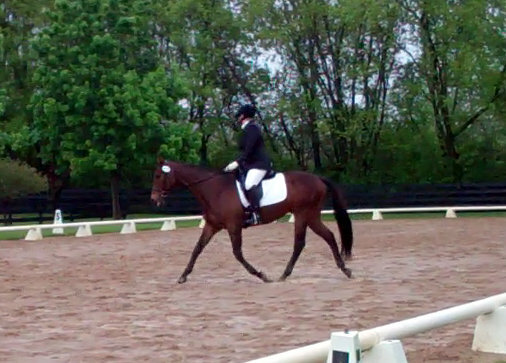 He was relaxed, ears flopping, and we walked quietly to the warm up. Our second warm up started out really well. Derby was relaxed and listening but still had really nice energy. The half-halts were starting to work, he was keeping an ear turned back toward me, and I was getting some marvelous, round trot from him. 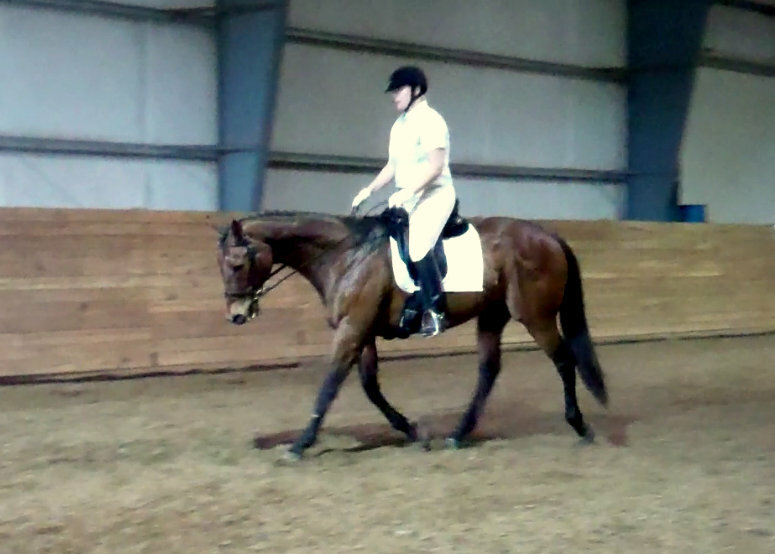 I did some transitions within the gait (little trot/big trot) and was totally excited by the awesome gaits I was getting when I let him roll. 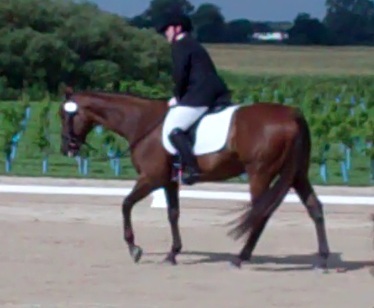 Here, finally, was my show-ring trot. It felt great and I was totally looking forward to redeeming ourselves. But then, inexplicably, the tension returned. I don’t know what happened, because there was no real change in weather, and the other horses in the warm up were all being totally cool – no one was melting down. But suddenly my nice, relaxed, floppy eared horse vanished. The head came up, the ears were immovably forward, and the neck became rigid, with the muscles underneath bulging. Crap, crap, crap. I went back to transitions, which had gone to pot. 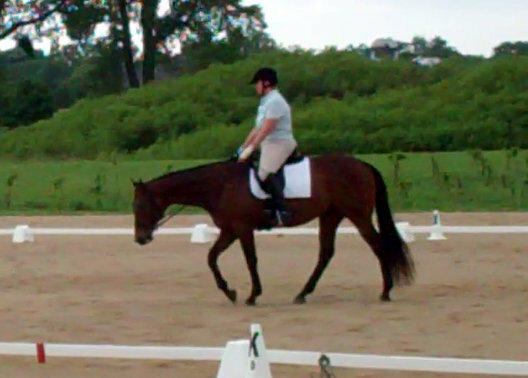 I tried some spiral-in/spiral out, and had a few hopeful moments as I struggled to keep my right leg draping around the horse, inviting him to wrap around it. But the hopeful moments were fleeting, and I was pretty much back to where I was before the first test. We walked, I tried some free walk, which is something we’re getting pretty good at, but nope – to free walk you need an honest connection, and when I invited him to stretch, I got no response, because I had no connection. 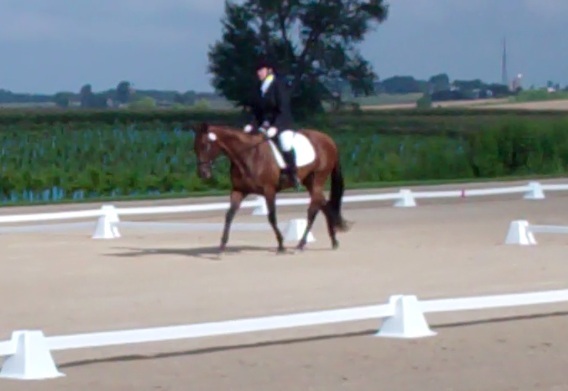 The second test was no better than the first, with one exception – I did actually manage to get him to soften and round a bit on our trot circle to the right. However, we committed a variety of sins against geometry, wove drunkenly down the centerline and played a little hokey pokey (put your right haunch in, put your right haunch out …) at X. 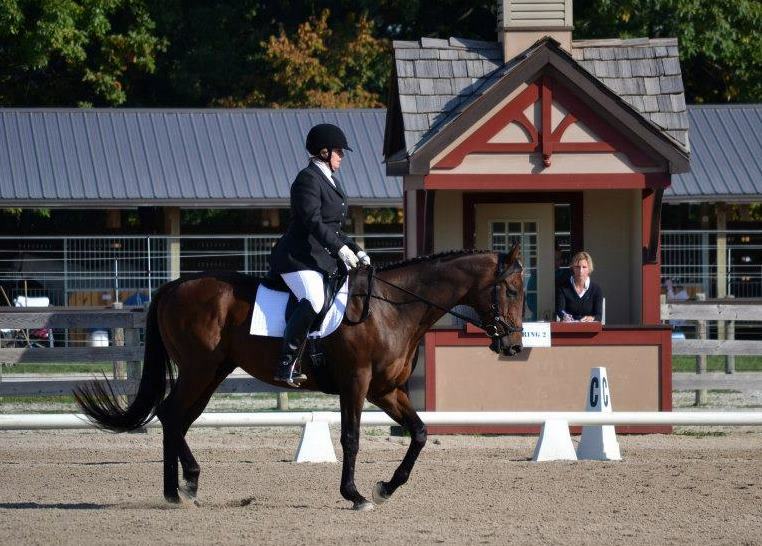 The test scores (60 and 59.5) were, in my opinion, inflated – even by schooling show standards. And the commentary was what I expected, nailing us for tension, lack of harmony, the rider’s ineffective aids and fairly astounding inaccuracy. But, there were a few wins. 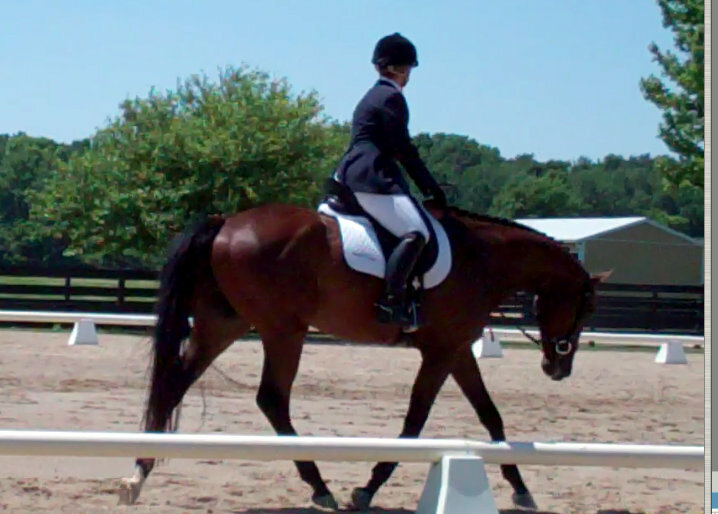 I was happy that Derby did have some relaxed moments, and happy that I was able to do a little effective schooling. I need to get much faster at developing and deploying my own responses and corrections, certainly, but the fact that I was able to figure some stuff out is encouraging. 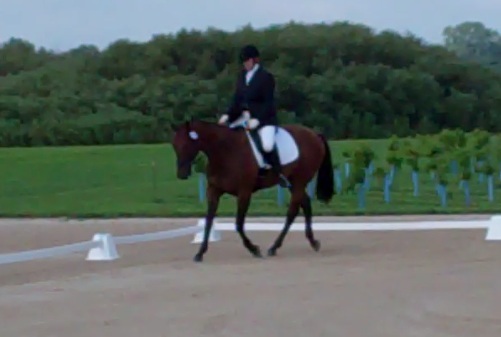 I’m happy that during those few nice moments in the warm up I was able to produce some fancy gaits. And best of all, at no point in the day did I feel scared or intimidated. Annoyed, yes. Frustrated, yes. But skeered? No. And that’s coming from my growing confidence is Derby, who really is a very good boy. His biggest problem is his pilot!